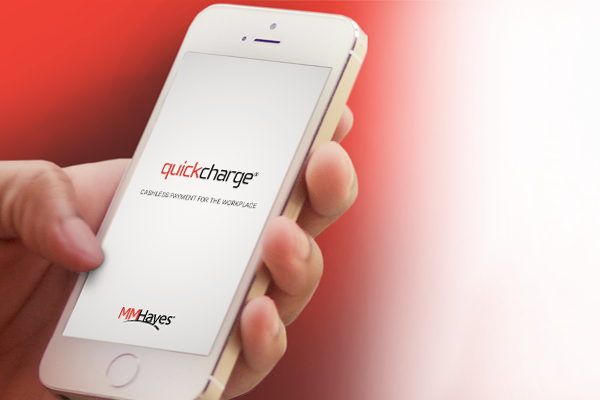 Available for Android and Apple devices or through a web-based portal, My Quickcharge puts the power of Quickcharge at your fingertips with a wide array of self-service features! Click the icons below to explore some of the exciting features of My Quickcharge, or scroll down to take a complete tour! With the My Quickcharge mobile app, users have easy access to their Quickcharge accounts at all times. By enabling self-service capabilities, you’ll unlock a wealth of benefits for account holders and for your organization. Click here to learn more about Quickcharge cashless payment solutions. Save time and skip the line with My Quickcharge online ordering. Drive sales and increase productivity by accepting online orders through My Quickcharge. 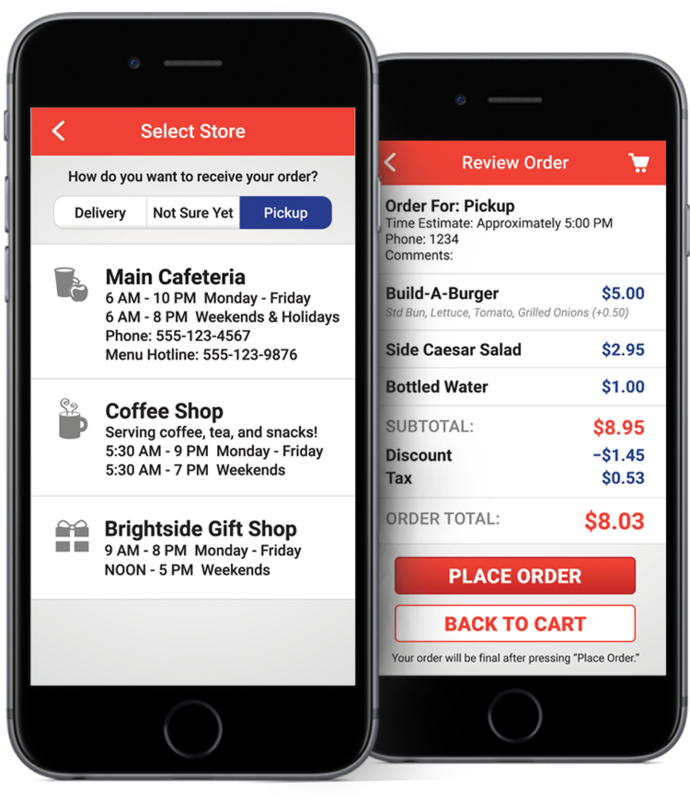 Employees can easily navigate menus of participating venues and place orders for pickup or delivery. Build custom menus of items available for online orders. Detailed orders automatically print to a kitchen printer. Configure specific hours of operation for pickup/delivery. Employees will love skipping the line to get their orders faster! Encourage repeat business with a customer loyalty program. 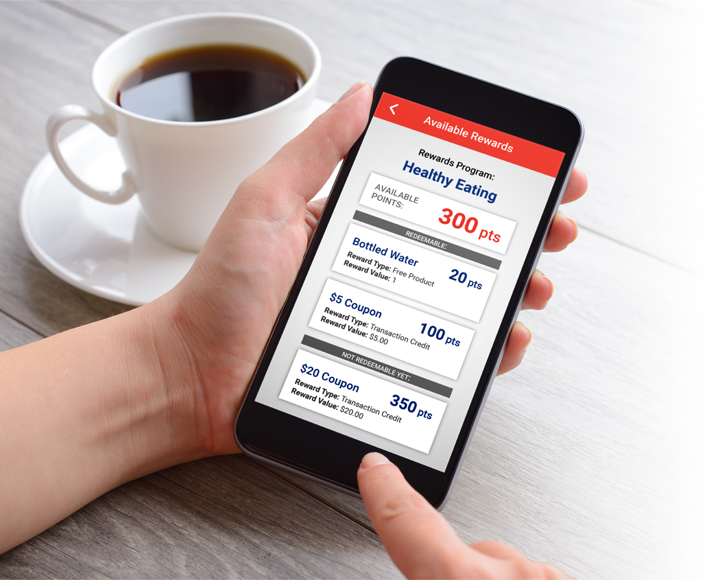 Quickcharge supports a wide array of program types including digital punch cards, wellness initiatives, and much more. Configure earning methods, reward types, and point values to fit your needs. 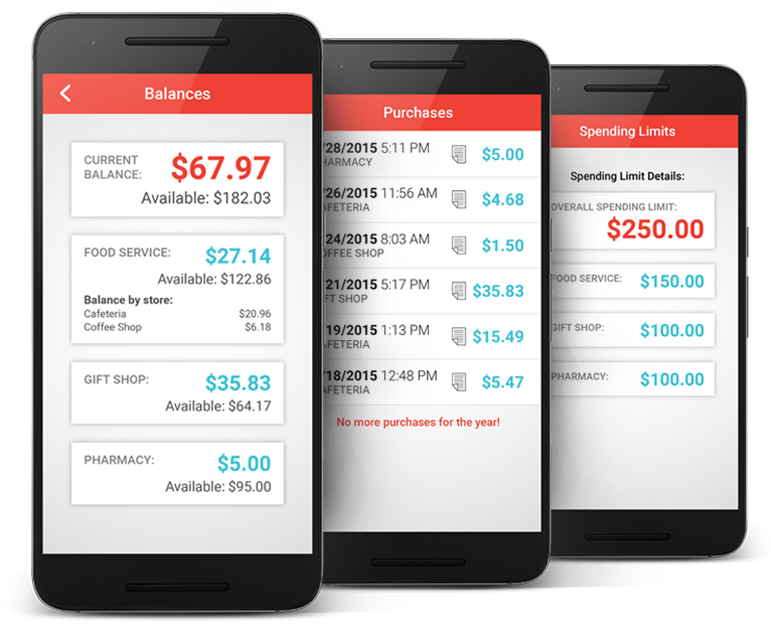 Earn points based on amount spent, healthy choices, or specific products. Check point balances, available rewards, and history from My Quickcharge. Supported reward types include transaction credits and free products. Detailed visibility for account holders. Increase convenience and peace of mind for users and ensure compliance with state and local laws by offering account holders full visibility into their Quickcharge accounts. Current balance and amount still available to spend. Purchase history and details of individual transactions. Spending profile details including limits at each venue. Detailed receipts for any Quickcharge POS transaction. Payroll deduction history including total amount deducted from each paycheck. Funding history of deposits made to prepaid accounts. Simplify onboarding and encourage adoption by allowing employees to sign up for Quickcharge with no involvement from HR. Choose from standard authorization agreements or add your own language. 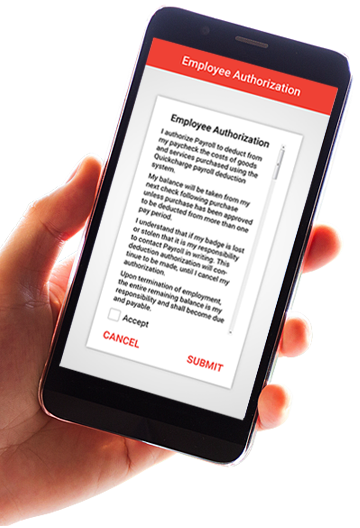 Eliminate the need for paper forms and manual entry. Ensure that users are fully aware of all payroll deduction policies. Freeze a lost badge to stop purchases. Lost your badge? Simply “freeze” your account using My Quickcharge and your badge will instantly be barred from making any further purchases. If a lost badge is found, the account can be unfrozen at any time. Improve the security of your Quickcharge solution. Grant employees greater peace of mind. No involvement is needed from HR if a badge is only temporarily misplaced. If you’d like to learn more about deploying My Quickcharge within your organization, enter your contact info below and an MM Hayes representative will contact you.